The bbluv baby and kid sized Anti-UV tent Suni pops up and folds back down into a disc. It’s lightweight and protects from both UVA and UBV rays, as well as wind. With a vent flap in the back, a carry bag and 3 pegs to secure in the ground, this super lightweight tent is easy to carry to the park or beach. 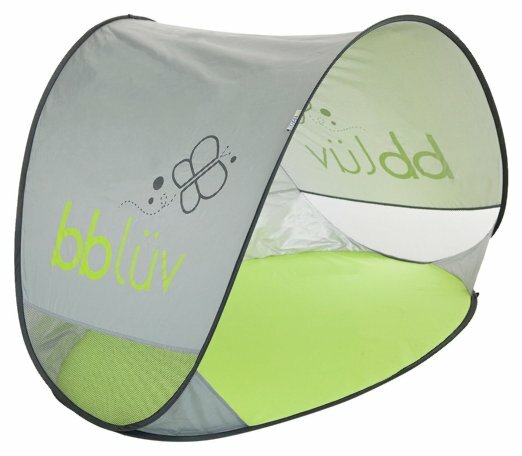 Found on Amazon, the bbluv Suni can be shipped quickly and used year after year with little ones. What’s a swim diaper? A swim diaper lets liquid through, but contains solids. This prevents anything unwanted from making it’s way into the water. 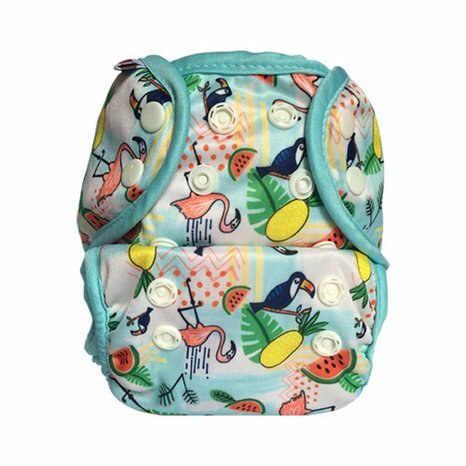 Bummis, offers swim diapers in a one-size design, fitting babies from approximately 10-35 pounds, and multiple patterns and colors these are great for cloth diapered and non-cloth diapered babies alike. With a snap-closure and double gussets, these swim diapers are accepted by swim classes and pools. The Bummis swim diaper is available to purchase from Lagoon Baby in Canada or Nicki’s Diapers in the USA. Time in the sun wouldn’t be complete without baby safe sunscreen. This sun protectant cream by Les Produits de MaYa is made from natural, organic and whole ingredients safe for kids and babies. With zinc oxide as the sun-protecting ingredients, this blend is made from organic extra virgin olive oil, organic coconut oil, organic yellow carnuba wax, organic shea butter, zinc oxide with no nano and Vitamin E for preservation, this cream smells great and protects well too. Les Produits de MaYa outdoor protective cream can be purchased from Calgary Cloth Diaper Depot. For the giveaway! 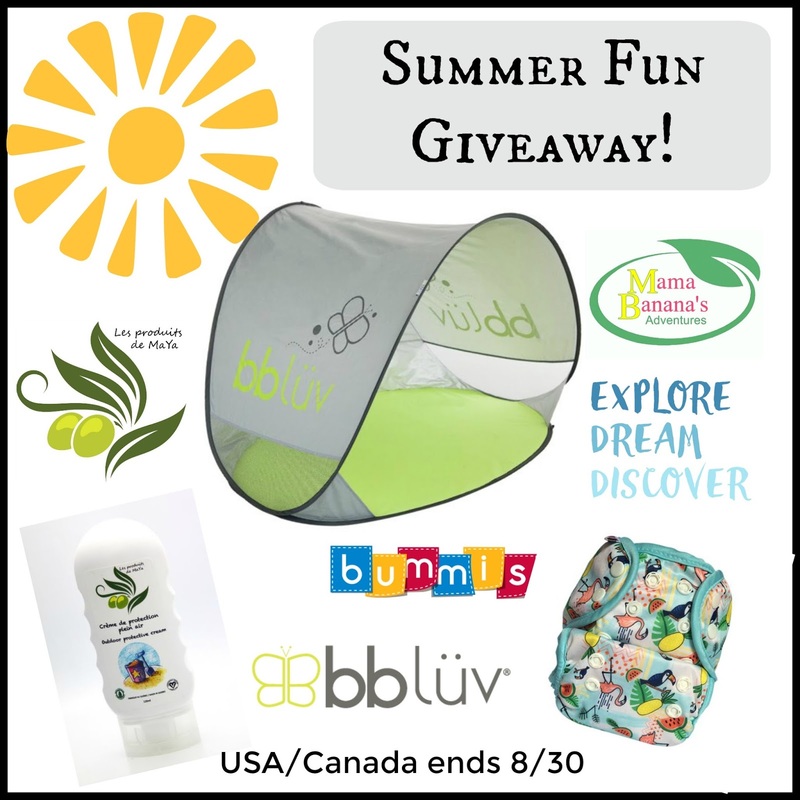 One lucky USA or Canadian resident will win all of these items. Legal, 18+ residents, void where prohibited. Good luck and thank you for stopping by! Please make sure to show some love to the participating bloggers, your facebook likes and follows on our accounts mean the world to us! Good luck! I am most excited about the swim diaper. I am most excited about the Tampa diaper…I live in Tampa! Here in Florida we are definitely not on the last days of summer…we still have at least a month or two. We are loving the pool and the beach! I am most excited about the swim diaper. It isn’t quite the end of summer yet here but my husband and I hope to take a small vacation before the end of Aug! I’m most excited about the BBLuv UV tent! I’ve always wanted one! I’m most excited about the swim diaper! I’m 38 weeks preggers so I’m spending these last days of summer just relaxing and anticipating the arrival of my little dumpling. 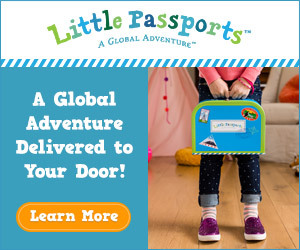 My hunny and I already have our plane tickets booked for central america in december so all the products would make us happy, but the swimmi especially! I am most excited about the swim diaper!! What a cute print!! We are spending our last days of summer getting unpacked from our move! AH! I love the kids tent! We are spending it just relaxing and being with eachother before school starts back up, I admit it has drove me a bit crazy these past couple months but so worth it! I am most excited about that beautiful swim diaper, because it’ll be the only one I’ll ever need, so no buying packs of sposies that we won’t use up each year! We’re spending the last few weeks of summer trying to get outside when it’s cool, and holing up in the a/c when it’s not. I am hoping for a few more nice beach days. And more family walks in the evening.